As you know I love to tat animals...well I love animals! so inspiration is always useful. Remember when I posted about my trip to Belfast and the zoo in Feb..well it was time for another meeting of the research committee and this time it was held in Dublin Zoo. One of the advantages of getting old...er in Ireland (bet you didn't think there could possibly be any!!) is that everyone gets a Travel Pass when they reach seniority and can travel FREE by bus or train anywhere in the island of Ireland..south and north. Is that cool or what! Well hubby just got his and I can travel free with him, the world is our oyster ...well Ireland anyway! and sooooh we went up to Dublin by train twice in one week!! to the Bloom garden and Flower show (our Chelsea!) which was fabulous, the weather was just like summer! Two days later we were on the train again but the weather couldn't have been more different....it rained constantly till 5pm when it stopped for a short while only to start again. 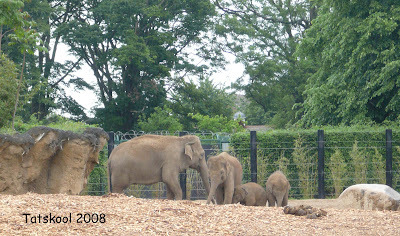 I had not been to Dublin Zoo for about 20 years since we took the Brownies on an outing and it's changed a lot. 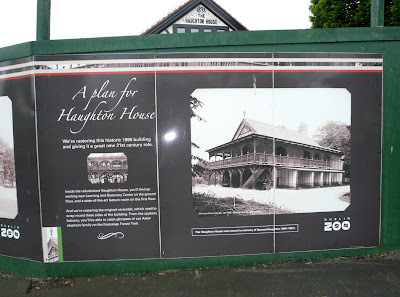 Dublin zoo is the third oldest zoo in Europe having started in 1831 in the Phoenix Park and was a typical Victorian Zoo of caged animals. First stop was the new Meercat Restaurant I had been dying to see. It has a viewing area at one end. 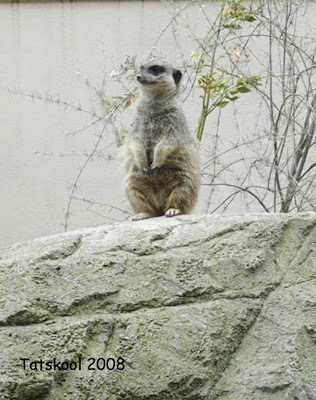 I was hoping to see the meercat on watch duty stretched up to his full height but the group were obviously not under any pressure and so he was only watching half heartedly. 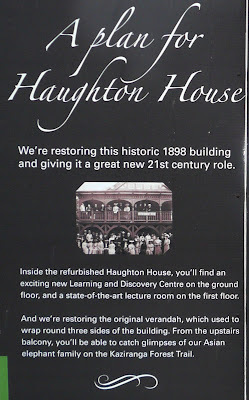 A walk outside in the rain....interesting to see the renovation of an old Victorian animal house was in progress. 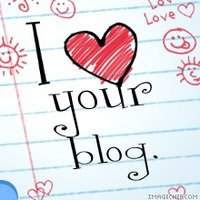 Hope you can read this if you click on it. It must have been a wonderful spectacle for visitors who didn't get to travel to see animals much or watch them on television. How things have changed. 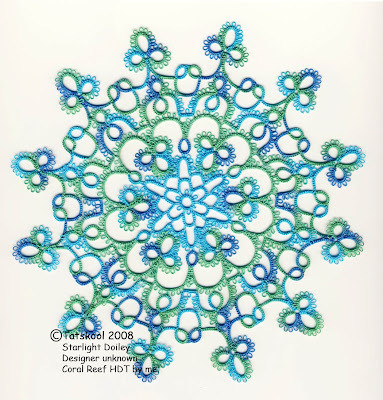 Moving on...what about this for a headdress inspiration for tatting. 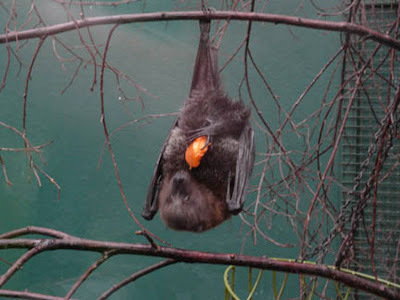 or this Rodrigues Fruit bats eating a piece of fruit, not much like my tatted bats. But the bit that I liked the most was the new elephant area. 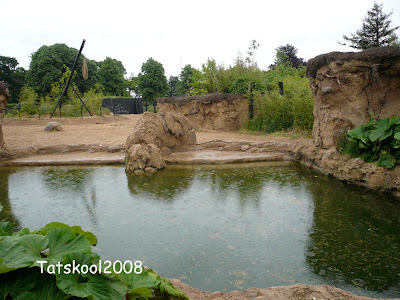 Elephants need access to water to keep cool in the summer and this area has two pools, don't they look inviting? You can see the rain. I liked the walkway to the elephant area from the restoration house complete with elephant footprints in the concrete. 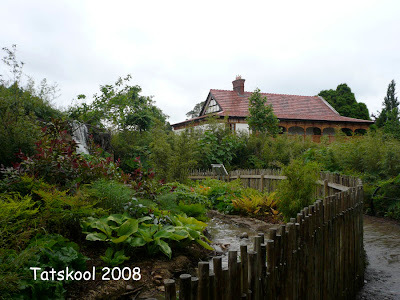 The whole zoo complex is a pleasure to see just for the landscaping and planting. I didn't think the elephants would be out in the rain but they were. It was good to see how big an area they have to live in. I had ro zoom in on this photo a lot to be able to see them they were so far away. 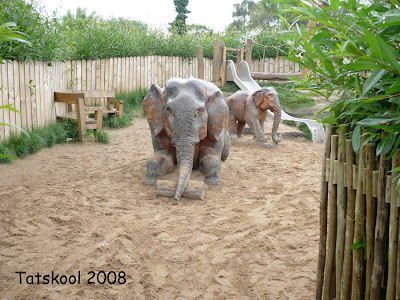 Modern zoos can be wonderful and the three Irish ones have great conservation policies. Their breeding programmes often returning animals to the wild. They each specialise in breeding certain animals. The latest baby elephant to be born in the zoo last february is in that group. 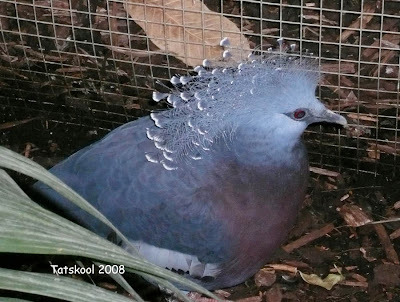 the zoo held a competition for to find a name for it and an 11 year old boy won with the name Budi which means wise one. 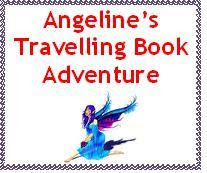 Hope the video link still works, there may be an advert first. What I didn't see at the zoo was the main attraction of the day bit I didn't know, it was the first appearance of the new baby white rhino, born just the week before. She looks fabulous and is the first rhino to be born in 14 years. Hubby did get to see it after his meeting. Do take a look at the video link..hope it's still active..the baby is so cute. Guess there will be another competition to name it. 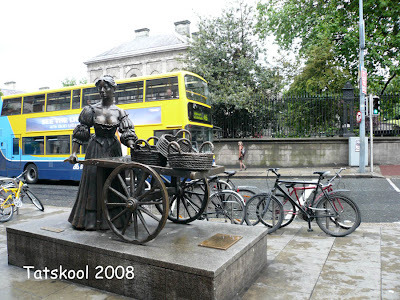 I wanted to able to show you some photos of Dublin City but the rain got worse and worse..the sort of rain when cars sent water shooting up at you as you wait to cross the road, and every one jumps back. The best I can do is Molly Molone wheeling her barrow, am sure you all know the song. Maybe more next time I go. 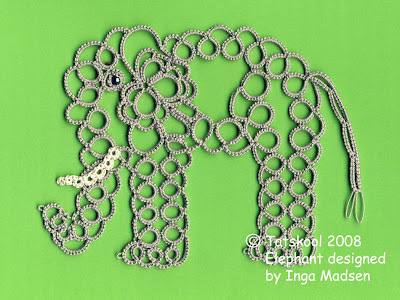 Well you have waited patiently for some tatting, I promised you elephants and here they are. 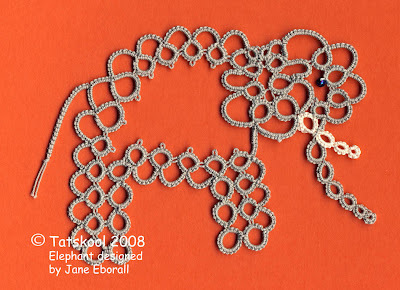 First up was Jane Eborall's elephant. This cute elephant I think looks more like a Woolly Mammoth and I am tempted to tat it again in a earthy brown which would be perfect. Next was Inga Madsen's elephant and I just love this one for it's realism and that's what I am looking for. I did give it a tusk as it seemed naked without one! Now a pair of elephants. I changed the pattern slightly so that I could have two different elephants and added tusks to both. The front one is my version, still not happy with my trunk. Wanted to make it thinner and more curving up without doing major changes to someone else's pattern. You will be hearing more about elephants..no don't groan..but first I need to dye some thread so that I can tat a green elephant!! It's Fathers Day today in Ireland and our daughter made him a card. We had never seen this photograph before tho' remember the occasion well. This was taken on her wedding day almost two years ago. 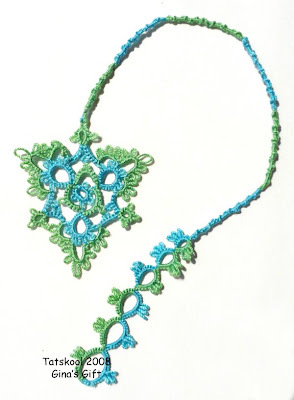 My friend had made a bobbin lace horseshoe for her for good luck, but her luck was running out when she suddenly discovered that she no longer had it. 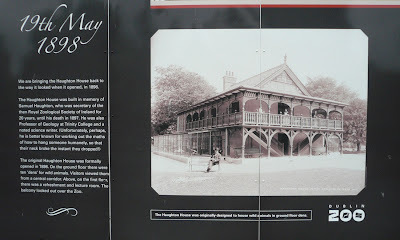 She was standing on the Japanese bridge at the hotel having photographs taken when the horseshoe parted company from it's ribbon and slipped unnoticed between the wooden slats of the bridge and into the large lily pod beneath. 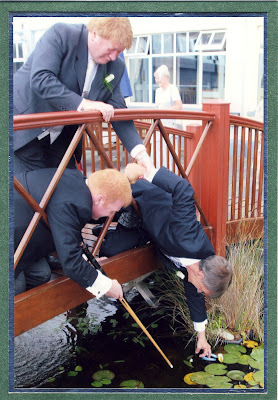 Someone spotted it and ran for something to fish it out with...the hotel provided a snooker cue but before the grooms brother had his chance the fathers took over! They joined forces and while her dad just managed to reach it, his dad hung on to him for dear life. What a fab' photo captured just at the moment of possession. Lets hope her luck lasts for a long, long time. Maybe now is the time to tell you that we are hoping they will make us grandparents in October, fingers are tightly crossed. First grandchild for both sets of parents. I have seen the first scan......looks a bit like a baby gecko to me!!! 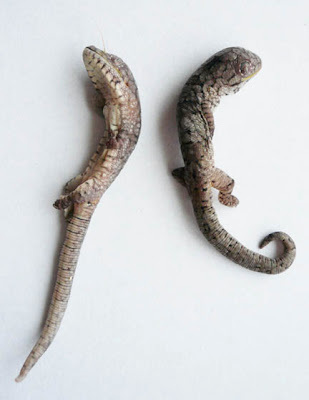 But then baby geckos are gorgeous! 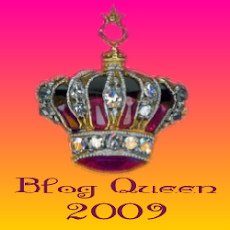 Remember my telling you about my lucky day...one of the things was that I had won the March Draw in Gina's 5th anniversary of her blog celebrations. Well at the end of May a box arrived, after a couple of hours of shaking it and admiring it I knew I was going to HAVE to open it...anticipation only lasts so long!! I tried to take the items out one by one to make this unchristmas stocking last as long as possible. There were so many things in it..no wonder it took her so long..she had kept telling me "It will be coming.......soon" and I kept telling her not to worry that I knew that miracles take a little longer! 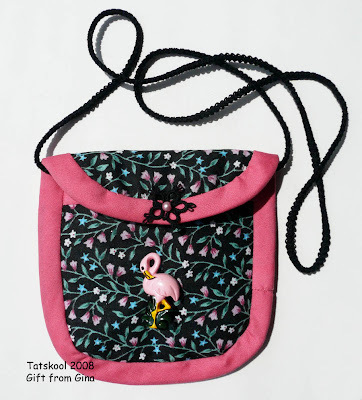 It has a lovely flamingo button and a tatted fastener and the cord is Romanian point lace...what a clever lass she is. Inside the bag was another bag and inside that a shuttle decorated by Gina with flamingos on it. My first hand decorated shuttle too. 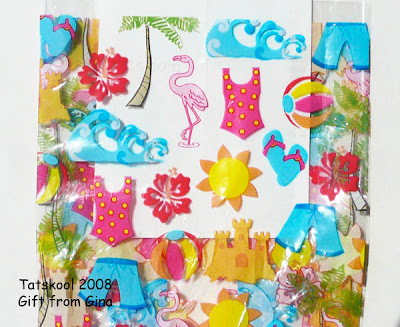 I know that she had such a lot of trouble trying to find a flamingo to put on it and finally found them on a cellophane bag! and boy were they trouble to apply and varnish, looks lovely tho. 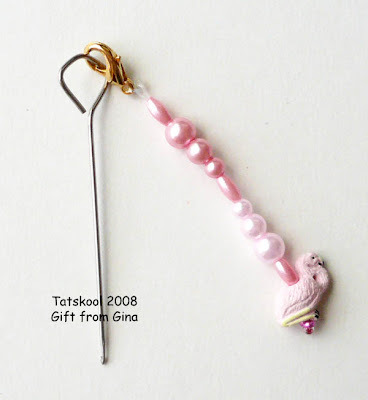 Along with the shuttle was a striver (my first) with a flamingo bead on the end. I soon found a use for it on the end of my Milwards Hook to stop it getting lost. Gina said that the bead came from Vons. Now I met Gina in 2006 when we went to Chicago and we have been great friends ever since. She took me to Vons and I have to say that it was one of the greatest bead shops I have ever been in.....a veritable Aladdin's cave. But it has one other huge thing to recommend it.... a second hand bookshop built into it!! that had hubby so engrossed that he had no idea how long we spent agonising over which beads to buy...he thought we had been so fast!! Every bead shop should be like that! 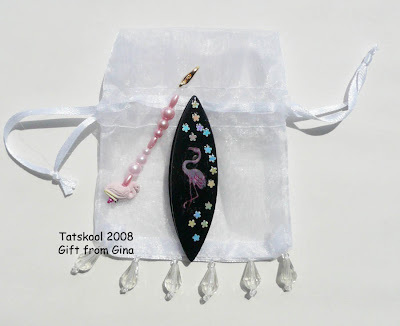 Gina had also made another pouch with flamingo material..she was not too happy with this but sent it anyway as who else would like a flamingo pouch!!! Good job cos I love it! 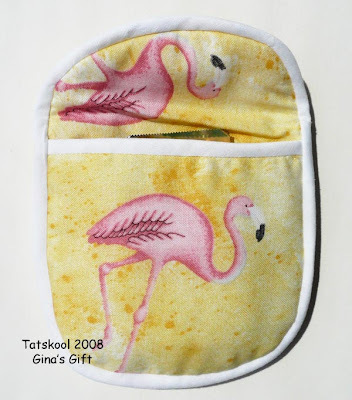 Next out was a divine amulet bag in flamingo colours. I have long wanted to make one of those as they have fascinated me. I have the pattern so no excuse now. 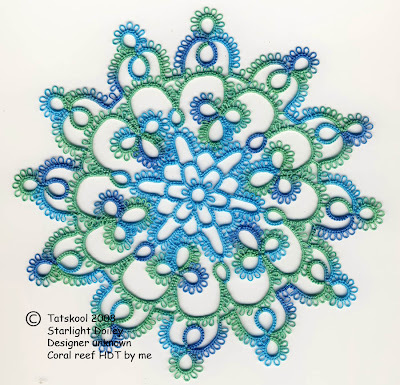 Even more tatting left in the box, the lovely bookmark that she showed on her blog. 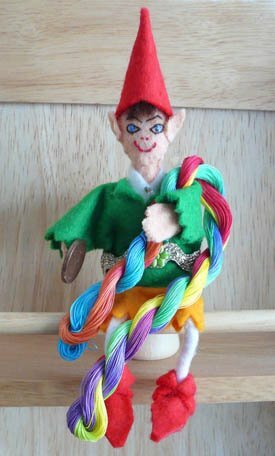 I would love to make one, the tail she made is so clever. 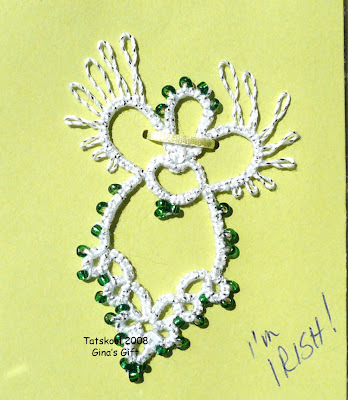 Finally an Irish Angel with green beads and sparkly thread, first angel anyone has ever sent me. 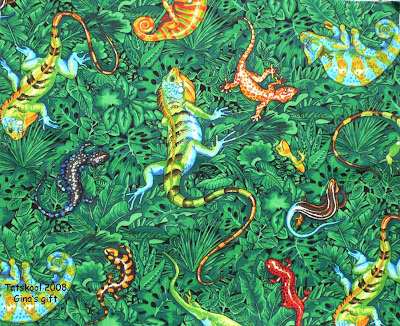 There were lots more goodies in the box including a Workbasket magazine to add to my collection from Carol Laweki,thread samples,Hugo's magic tape to stop my ball unrolling all over the floor,but mustn't bore you, BUT I have to show you this fabric she sent, she was going to make a bag but the reptiles were a bit too big. Isn't that just fantastic, DH named every one of the reptiles!! Now what am I going to make with it...answers on a postcard please!!! Gina thank you so much you certainly made my day...well my year actually. This is going to be LONG! Go get a cup of tea and chill with me, why not just take the rest of the day off!!!!!!!!!!! 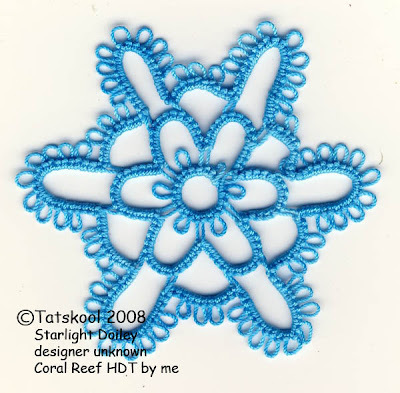 My latest HDT is called Coral Reef and this post is all about WHY? My DH as well as being mad about geckos is a marine biologist....more specifically a taxonomist working on amphipods. Yeah I know you are going to say too much information! Taxonomists consider the characteristics of animals and their relationships, they are the people who decide that a particular animal is different enough to be a new species. 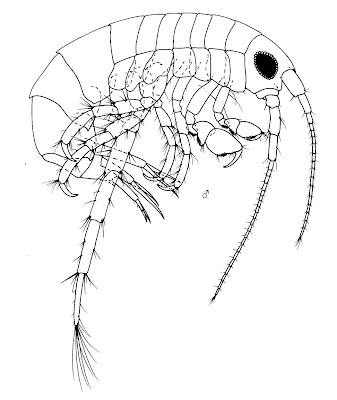 Amphipods are what I call little shrimpy things! This always make him laugh as he says they are about as close to shrimps as dogs are to cats! They are laterally flattened(from side to side)crustacea and belong to the Order Amphipoda. Amphi-poda means different legs. He calls them the swiss army knife of the animal world as each pair of legs (and there are a lot of them) has a different function, some for swimming, some for eating, some for reproduction etc. You get the picture. Now the only thing I have ever had dedicated to me (before Martha's new book Holidays on the block) is an amphipod! YES Paracalliope mapela is MINE! It swims around in the tropical waters around Fiji....just like I would! Ahaa! 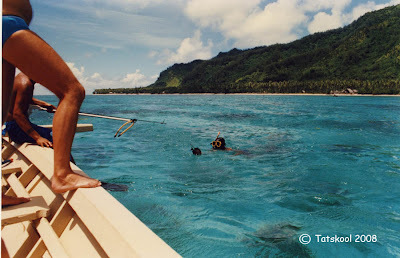 now you are all wondering what is the relationship between HDT called Coral Reef and an amphipod swimming round Fiji......not a lot I suppose! I do keep wondering if Jane will design an amphipod for me..but I know what she will say.....DIY! OK back to the amphipods. DH has this strange aversion to cold water meaning that he can only study amphipods that live in tropical waters...so if an amphipod should happen to live somewhere cold then FORGET IT!!! This has meant that in order to collect,study, identify and describe new species he has been forced to travel to the tropics and we were forced to go with him...yeah I know what you are going to say but someone had to do it!! 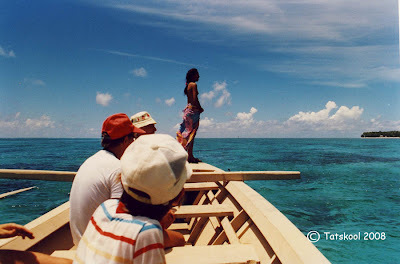 So now you are getting the picture..tropical waters..coral reef..yeah how lucky can you get! Tropical waters round a coral island just have to be one of the most beautiful things you could ever see, ranging from the pure turquoise blue of the shallow waters of the lagoon to the more turquoise green over the barrier reef where the corals and the coral fish are to the deepest blue of the ocean, Indian or Pacific. So these colours take me back in time to glorious days. I haven't got great photos to show you as they are best when taken from the air. 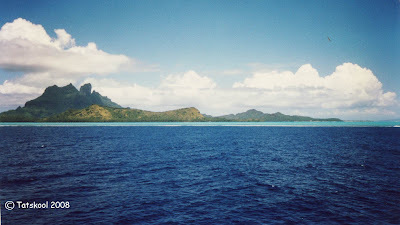 This was taken coming into Bora Bora, just look at those colours. Just look at the blues and greens on this parrot fish they caught. Now for a rare glimpse of yours truly, one of the few photos that I actually like to look at!! Taken in 1986 in Rarotonga (Cook Islands), the dress, hand screen printed, bought in Fiji in 1979 is still my favorite dress of all time. Those were the days of wearing a hibiscus flower or a frangipani or gardenia in your hair. The flowers stay fresh for the whole day, on or off the plant. 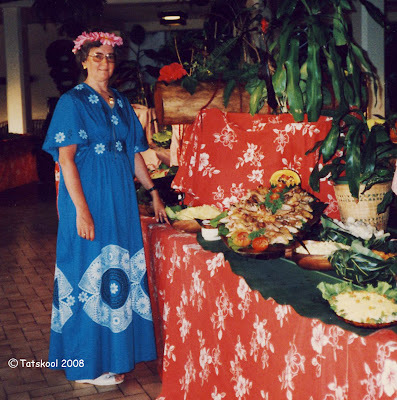 My daughter used to adore helping the hotel staff to thread the flowers on to stiff fibres for a vase or to make a leis to wear round your neck or as a headdress. 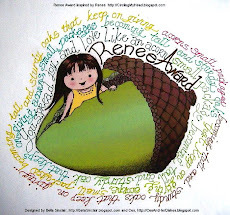 Dream on girl! We grow hibiscus and frangipani at home now you can see why. Back to reality, keep these colours in mind, my very favorite colours and you will see why I have tried to capture them in a hand dyed thread. 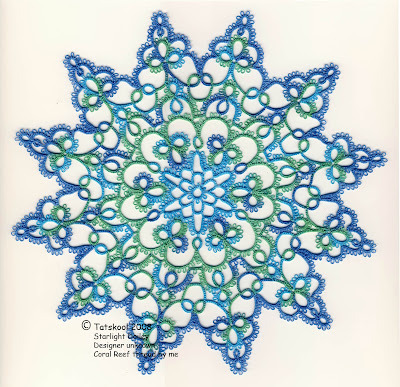 If you have stayed with me this far we finally get to the tatting bit, hope it was worth the wait. the big project that I have been working on for the last month was a doiley (two in fact) to represent a Coral Reef. I saw this doiley tatted by Clyde in Marlilees Tourmaline and fell in love with it. 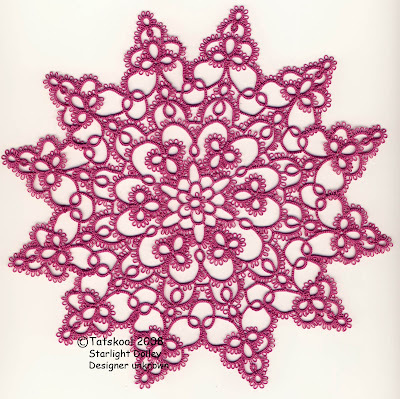 Its the Starlight Doiley a 1944 pattern in the Tatters Treasure Chest, originally published in tatting book 207 by The Spool Cotton Company. One of the things I like about some doiley patterns is that if you run out of steam, each round added makes a different doiley by itself. So let me walk you thro' my doiley. Well I have to get the most mileage out of this it took me forever! Every picot was measured! I dyed the three coral reef colours separately too. Round 1 and 2 are in turquoise and represent the lagoon. Since I have no island or sandy beach in the center this must be an atoll. The volcanic island has finally disappeared beneath the water. Round 3 in turq green and variegated threads represents the barrier reef. I love the way the fingers of the lagoon go into the reef and also the way the picots of the trefoils look like coral polyps. Phew! Here is the last round in all it's glory using the deep blue to represent the reef feathering out into the open ocean. Hope I got the colour proportions right. The thread is DMC Cordonnet special size 20, the finished doiley measures 10.5 inches and used approx. 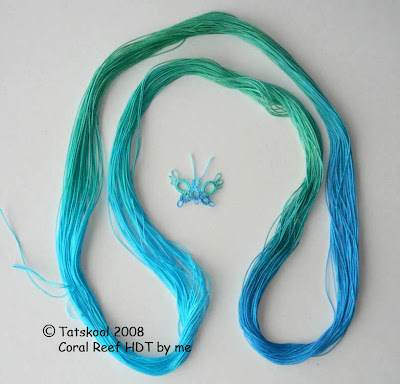 4.25m of turquoise blue, 6m of turquoise green, 20.5m of blue and 34.5m of the coral reef thread. 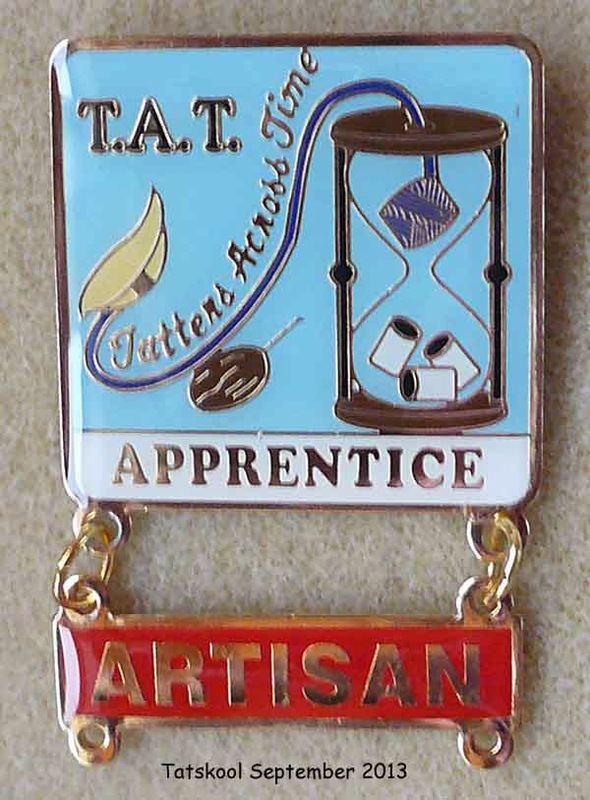 You might need more depending on how tight you tat and how big the picots are. I find it very important to know how much thread I need when I am using hand dyed thread that I only have a fixed amount of. For this reason I always tat a sample first. I know it's a lot of extra work but it does give a lovely comparison of the effects of colour too. 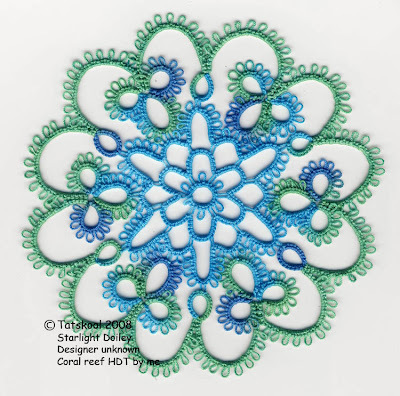 This was made with Flora 20 and is a little bit smaller than the coral reef one, I find that DMC thread is a little softer than Flora or Coats. It took 76m of thread. My only crit. about this pattern concerns the final row. The chains joining into the two ring unit of the previous round don't lie well and tend to buckle. 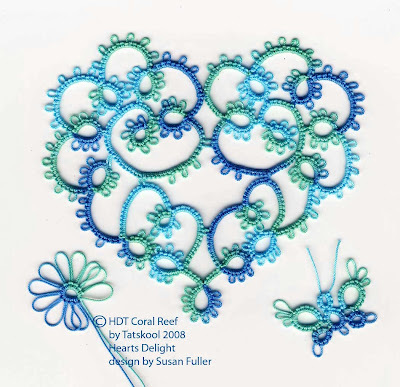 In my coral reef doiley joined the last picots together and also in the chain joining into the trefoil. Of course I then kept forgetting to make less picots!! If I made another ever I would reduce the stitch count and it would lie much better. OK now you can go back to whatever you were doing before you chanced on this blog...if you can remember that is after all this beauty! !